This very simple, fresh dish is ideal as a first course. Run your fingers over salmon fillet to check for any remaining bones. Using tweezers, remove bones. For each portion proceed as follows. Cut an angled slice about 1 cm thick from fillet. With a very sharp knife, ‘butterfly’ slice by cutting almost through it and opening it out. Put fish into a plastic bag and, using the flat side of a meat tenderiser, gently flatten until very thin. 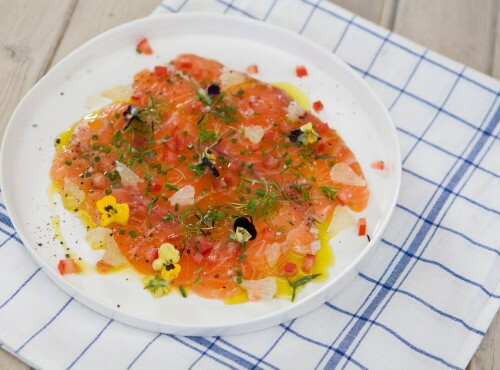 Divide salmon between chilled plates, then scatter with herbs and tomato, drizzle with oil and season. Serve with wedges of lime.